People power. It is often the solution to the most vexing of challenges. New Jersey’s degraded water quality is such an issue as people are both the source and the solution to the problem. As our rivers flow, everyone lives down-stream until the waters meet the ocean where our waters go global. Therefore healthy waterways depend on us taking the plunge together. Fortunately, two organizations are collaborating and making a splash. Today, thanks to the Geraldine R. Dodge Foundation, communities around New Jersey are working holistically to achieve sustainability as well as target water quality protection through Sustainable Jersey and Clean Ocean Action’s (COA) Municipal Blue Star Program, or Blue Star for short. Sustainable Jersey is a phenomenon and has created a pathway for communities to “go green” becoming more in balance with nature and saving important resources, both financially and ecologically. The Blue Star program combines the visionary Sustainable Jersey program with COA’s mission to improve coastal water quality. While achieving Sustainable Jersey certification, Blue Star inspires towns to focus and prioritize actions that will improve and protect water quality. The Blue Star program was officially launched in 2014. Blue Star was started because nearly all of New Jersey’s waters fail to meet the fishable, swimmable, and drinkable goals under the Clean Water Act. We have literally “paved the way” for these problems by abusing land and water resources, our antiquated infrastructure system, and people pollution (littering, fertilizers, pesticides, chemicals, energy use to name a few). Blue Star selects a menu of actions from the Sustainable Jersey list that will have the most positive impact on water quality including projects to treat stormwater runoff and homeowner educational programs that a town can implement to become better stewards of their waters. A candidate town must achieve 50 percent of the Sustainable Jersey points within COA’s menu list, as well as go one step further. There is an additional list of five waterway specific options and towns must complete one. These projects may include innovative water quality improvement projects, plastic bag bans, supporting a stormwater utility, implementing stricter town stormwater rules, or becoming a climate-adapted community. One benefit of the innovative option is to showcase new ways to tackle water quality protection. At the Blue Star launch event in September 2014, Environmental Canine Services provided a demonstration that showed how their work training dogs sniff out human sewage pollution. The dogs scent tracking skills have been used in various projects to track pollution, which then enters the waterways, on the East and West Coasts along with the Midwest Region. COA is partnering with Environmental Canine Services to bring their expertise to New Jersey. Whether a town is currently certified or just getting started, the Blue Star Program is an option they can work toward as part of their Sustainable Jersey goals. Through this initiative, not only will communities become leaders in environmental stewardship, but will also ensure the vitality of healthy coastal ecosystems, communities, waterways, and economies. 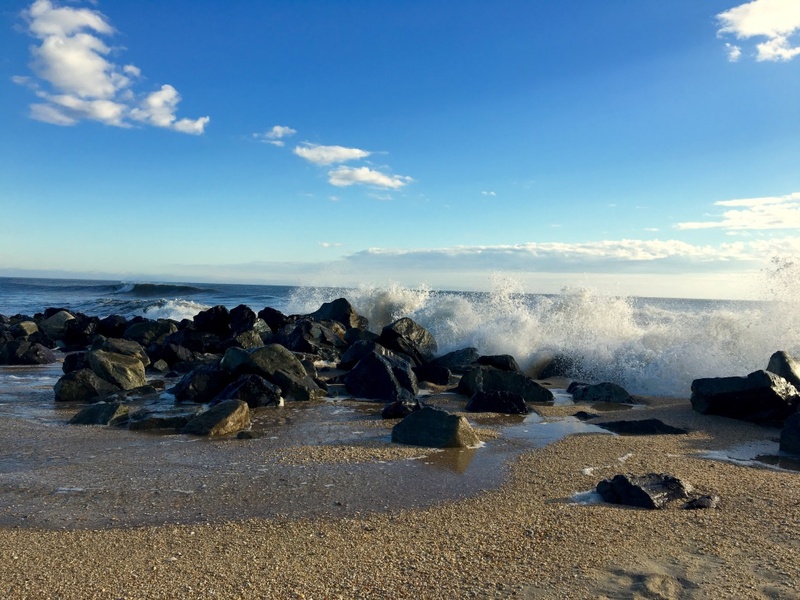 Within the first year of accepting applications, COA awarded three inaugural Clean Ocean Action Municipal Blue Star Certifications to Long Beach Township, Wall Township, and Galloway Township, to recognize their effort to improve water quality. All have been a pioneer in their region for sustainability work and planning for resiliency. They are influencing success in their neighboring towns, which ultimately is in the best interest of the watershed and estuary. For more information on how you or your town can get involved, visit cleanoceanaction.org, or contact Catie Tobin at education@cleanoceanaction.org, 732-872-0111. This entry was posted in Environment, Public Policy, Sustainable Jersey and tagged Blue Star Program, Clean Ocean Action, Sustainable Jersey. Bookmark the permalink.